Anchorage – On May 12th, the final day of the recent legislative session, the Alaska Legislature unanimously passed a bill authorizing the same pay and benefits for members of Alaska’s organized militia regardless of whether they are called to state or federal active duty. The House Military and Veterans Affairs Committee sponsored House Bill 150 to simplify and clarify the payment system for Alaska militia members. “The brave men and women that have volunteered to protect Alaska and our nation deserve to know how much they will be paid when they are called to active duty. The current pay system used by the State of Alaska is so different from the federal system that it prompts an unacceptable level of confusion and uncertainty. This simple bill fixes that, and I appreciate the unanimous support from my colleagues in the House and Senate,” said Rep. Chris Tuck, Chair of the House Military and Veterans Affairs Committee. The current accounting system used by the State of Alaska pays active duty members of the organized militia for specifically assigned duties. However, when militia members are called up to federal service, they are paid based on grade and rank. The new system authorized by the passage of HB 150 brings the state system in line with the federal system. House Bill 150 passed the Alaska House of Representatives last year by a vote of 38-0. 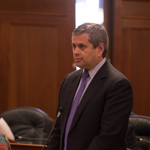 The Alaska State Senate passed the bill on the final day of recent legislative session by the unanimous vote of 19-0. HB 150 has been sent to Alaska Governor Bill Walker for his signature. For more information, please contact Kendra Kloster in Rep. Tuck’s office at (907) 269-0240.